leaves no one in any doubt that this is a fitness boosting activity. Nordic walking coach June Stevenson describes it as a complete workout that engages 90 percent of the muscles as well as improving posture and range of motion. It’s the perfect antidote to a sedentary lifestyle – she says prolonged sitting is an increasing health concern. June’s background in the health and fitness sector was one reason she was quick to catch onto the potential benefits of Nordic walking when she first tried it in 2004. Since then she has been instrumental in promoting the activity in NZ, building a network of qualified instructors, holding workshops and setting up around 10 self-supporting Nordic walking groups. She recently held a free trial and workshops on Orewa Beach and says the interest was such that she will hold a further free trial and workshop this month. The next free trial is on August 11 (see details below) and the Beginner’s Workshop takes place on August 18, at Orewa Beach, 2pm–4pm (meet in carpark by Orewa Surf Club). Poles are provided. 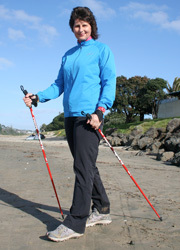 Image: June Stevenson says Nordic walking is becoming mainstream.